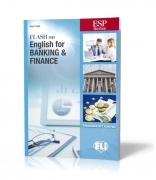 Flash on English for Banking & Finance + audio mp3 The book offers finance and banking-related vocabulary, presented in realistic situations, with practice of relevant language structures. 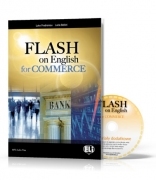 Flash on English for Banking & Finance will be especially useful to all students preparing to enter professions related to banking and finance, or to professionals who want to...more.. 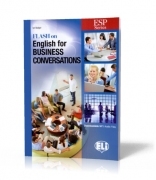 Flash on English for Business Conversations + mp3 audio Flash on English for Business Conversations is specifically designed for students who are studying to work in the business world. It develops spoken language skills by presenting and practising vocabulary and expressions that are useful in everyday working life; This book presents specific...more.. 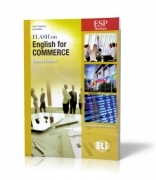 Flash on English for Commerce Flash on English for Commerce introduces the key concepts in business and trade. Levels Pre-intermediate / Intermediate CEFR A2 / B1 11 short and manageable units offer thorough vocabulary development, skills practice in realistic contexts and frequent opportunities for...more.. 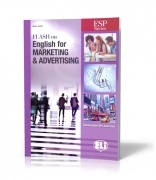 Flash on English for Marketing & Advertising + audio mp3 Flash on English for Marketing & Advertising is specifically designed for those who are studying for a career in business with a strong focus on marketing strategies and advertising, or for company employees who need to improve their language skills. A series designed to introduce topics,...more.. 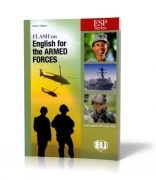 Flash on English for the Armed Forces + audio mp3 Flash on English for the Armed Forces will prove essential to students who wish to start a career in the military or security forces, and to professionals who want to improve their English language skills practicing profession-specific vocabulary and language structures in context. A series...more.. 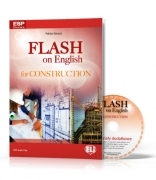 Flash on English for Construction Flash on English for Construction is suitable for anyone preparing for a career in the construction industry. Pre-intermediate / Intermediate CEFR A2 / B1 Components Coursebook (48pp full colour) mp3 files (available online) Answer Keys...more.. 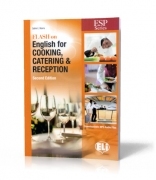 Flash on English for Cooking, Catering & Reception NEW EDITION Flash on English for Cooking, Catering & Reception focuses on specialist language and communication skills needed for a career in the catering industry. Pre-intermediate / Intermediate CEFR A2 / B1 Components Coursebook (64pp full...more.. 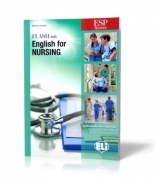 Flash on English for Nursing Through rich and informative content presented in realistic situations, this text provides students preparing to enter the world of nursing with language skills practice in topics ranging from medication administration to patient triage. Pre-intermediate / Intermediate CEFR A2 /...more.. 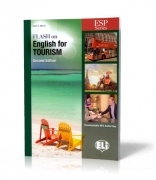 Flash on English for Tourism Flash on English for Tourism is suitable for students who are studying for a career in the tourism industry. Pre-intermediate / Intermediate CEFR A2 / B1 Components Coursebook (48pp full colour) mp3 files (available online) Answer Keys (available...more.. 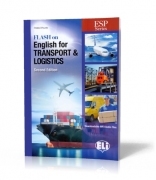 Flash on English for Transport & Logistics NEW EDITION + mp3 Flash on English for Transport and Logistics introduces the key concepts in the transport, logistics and aviation industries. Pre-intermediate / Intermediate CEFR A2 / B1 Components Coursebook (48pp full colour) mp3 files (available online)more.. Flash on English for Mechanics & Electronics NEW EDITON Flash on English for Mechanics, Electronics & Technical Assistance is suitable for students who are involved in vocational and technical education. Pre-intermediate / Intermediate CEFR A2 / B1 Components Coursebook (64pp full colour) mp3...more..
Best Commercial Practice - workbook English for Specific Purposes (ESP) Levels Intermediate - Upper-Intermediate CEFR B1 – B2 Components • Coursebook (384 pp full colour) • Teacher’s Book; Class Audio CDs; Multi-ROM Test Maker • Teacher’s Digital Book • Best...more..
Best Commercial Practice - Digital Book English for Specific Purposes (ESP) Levels Intermediate - Upper-Intermediate CEFR B1 – B2 The interactive digital book containing all the material in interactive format gives the teacher the chance to make learning English more stimulating with ‘heads-up’...more..
Best Commercial Practice - Teacher's Pack English for Specific Purposes (ESP) Levels Intermediate - Upper-Intermediate CEFR B1 – B2 This text-rich course of business English is designed for students preparing for a career involving sales, marketing, finance, international relations etc. -...more.. Excellent! - student's book Levels Intermediate - Upper-Intermediate CEFR B1 – B2 Excellent! trains today’s students in the hospitality industry with the language competences they will need for a successful future career. Catering, cooking, bar and service are all covered in this course which ensures thorough revision of...more.. Excellent! Catering: Cooking & Service - Teacher's Guide + 2 Audio CD Levels Intermediate - Upper-Intermediate CEFR B1 – B2 Teacher’s Book • Extensive teaching notes for each section. • Answer keys and transcriptions of listening materials. 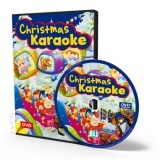 • Tests and extra resources for both stronger and weaker...more..